Over the years, we’ve done a lot of websites for non-profits. It has basically become an unintentional niche for us. We had fun analyzing the election websites in the previous blog, so we decided to do a similar exercise with a subject we have even more experience with. 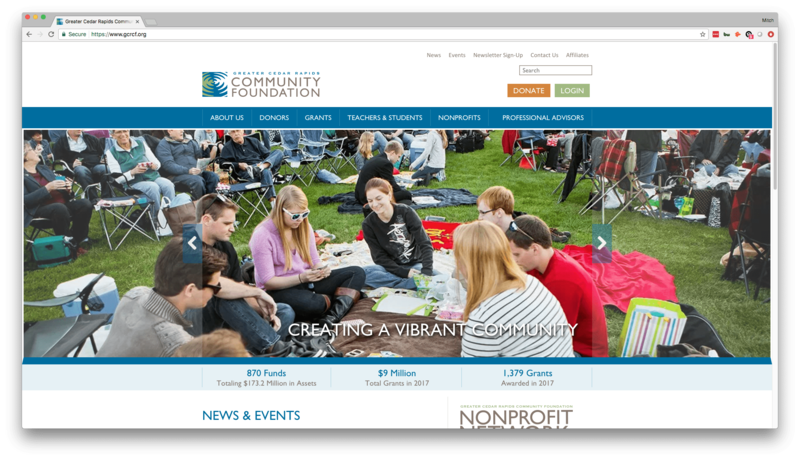 We decided to choose the websites of just three Cedar Rapids non-profits at random for the sake of keeping it short, though there are of course many other amazing Cedar Rapids non-profits that aren’t listed here. The calls-to-action here are great. The “Donate” and “Login” buttons are prominent and are differentiated from the surroundings by their colors, leading people’s eyes directly to them. This is great placement and usage of these calls-to-action, and my guess is that this donate button has generated a good amount of revenue for them simply because they make it easy for site visitors to give money! Cedar Rapids non-profits, and non-profits everywhere, need to make it as easy as possible for folks to give money online. There’s a lot of content on this website, but the navigation is done very well, making it easy to navigate right to the information you want with just a few clicks. The drop-downs on the main menu are clean and function well (there’s nothing worse than a drop-down that disappears on you). This is a great website, so it’s hard to find things to improve on it. One thing that stands out, however, is that the images in the header on the front page aren’t the highest quality. They’re a bit grainy, and with a website this professional, it’s expected that the images are crisp and professionally done. There are two navigation bars on the homepage, one along the very top that has “news, events, etc.” and then the main navigation with “about us, donors, etc.” There really should only be one, for simplicity’s sake and for the sake of the aesthetic. Perhaps there’s a good reason why they have these two navigation menus, but ultimately one is preferred. Two big things stand out as positives right off the bat – first, the images used are high quality and look great all all screen sizes. Second, the call-to-action to “Donate Now” is nice and prominent right there at the top. They’ve clearly thought through what their primary goal is for their site visitors, and they created their site to be as conducive as possible to achieving that goal. “Families Helping Families” is a bit of a vague name, so it’s crucial for them to clearly state what exactly they do in a clear and concise way. They communicate this very well on the homepage with the short sentences in the header slideshow, as well as in the three icons below the header that state their mission, specific programs, and their volunteer opportunities. You feel “bought in” very quickly after coming to the site because they do a great job of showing what they do and how you can be a part of it. Rounding out the homepage, they continue to make great use of space with both a touching video and some quick statistics further showing why the work they do is so important and impactful. We’ve discussed before how videos can be an effective marketing tool, and having some hard hitting statistics always gets your value across in a clear and digestible way. 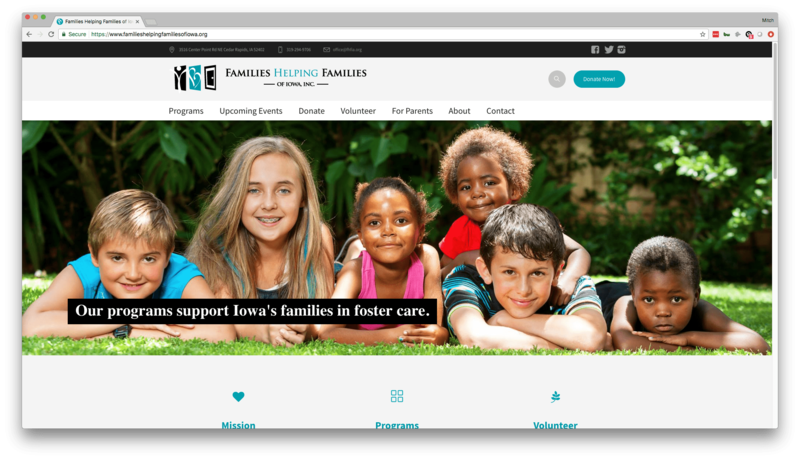 They do a great job of showing other Cedar Rapids non-profits how to win over your site visitors by pulling on heart strings. They say nobody’s perfect… But this site is pretty close. Aside from nit-picky tweaks, there really isn’t anything to change about this site. You can tell immediately upon arriving on the site what actions they want you to take, and that’s what makes an effective call-to-action. The actions of course are to donate and download their app. As you scroll down the home page, you see some key statistics, more calls-to-action (like to shop for their products or to become a volunteer), and even an informational video about volunteering – which are all positive points we made about the last website, so it’s great that they’re putting these things to good use on their site. Their workshops seem to be a major part of what they do, so it’s great that they have the schedule of all their upcoming workshops right there on the front page where they are easy to find. The design on the home page is a bit crowded, with a little too much text and images. It would be most effective to have it be simplified and cleaned up so as to not distract site visitors from the calls-to-action that they ideally want them to click on. While their “Upcoming Workshops” schedule is updated and full of events, their “Upcoming Events” schedule is not. This could be because it simply hasn’t been updated (which is a problem), or it could be that they just don’t have very many events, in which case an events schedule front and center on the home page is unnecessary and they should utilize a different method of displaying their sparse events. 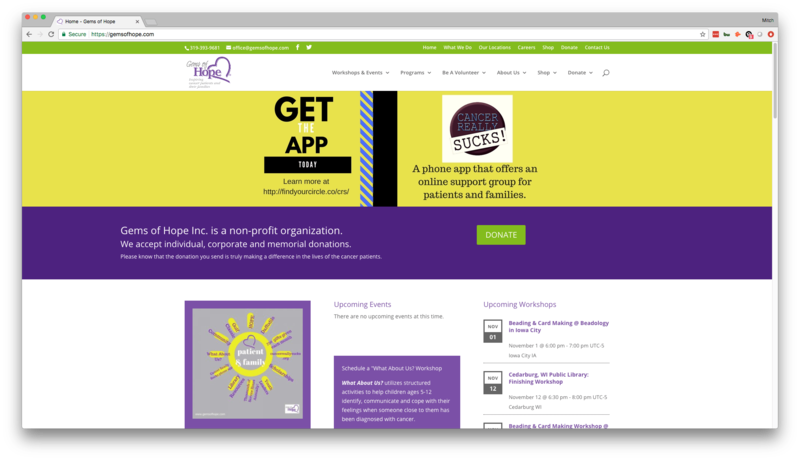 If you are a non-profit and need web design help, Big Imprint is a web design agency that serves the Cedar Rapids and Iowa City area. We’ve worked with over 40 Iowa City and Cedar Rapids non-profits, and we’d love to talk to you about your project! 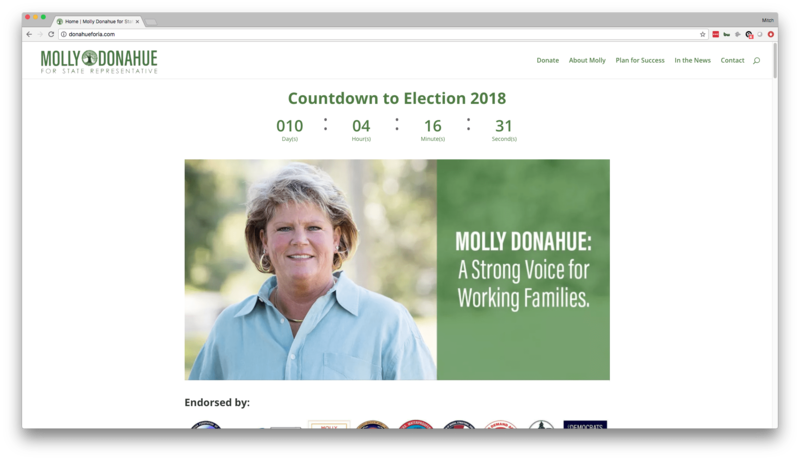 It’s midterm election season again, and that means that a bunch of candidate websites have popped up all over the place. In the Cedar Rapids election world alone, there are a ton of candidates running for various offices both on the state and local levels. Without any regard for political party or candidate preferences, we’ve decided to analyze the Cedar Rapids election websites to see what each does well, and where each could improve. Let’s start at the higher offices and work our way down to the local Cedar Rapids election sites. The site contains a lot of information that clearly encompass his views on a variety of topics. 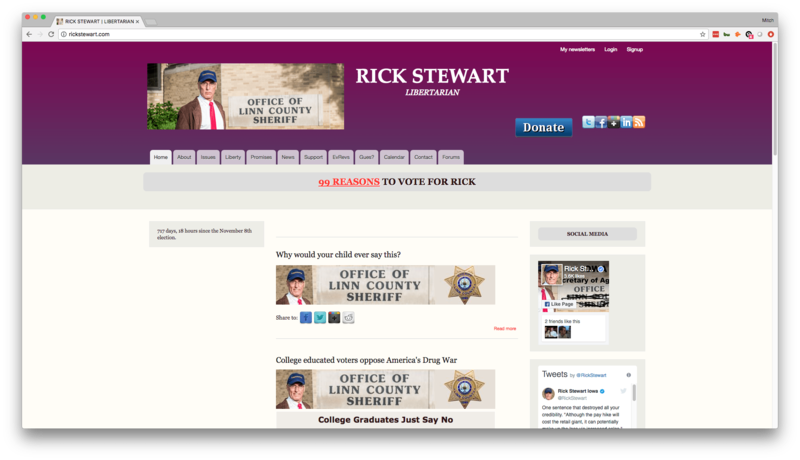 He has a great call-to-action in the “99 Reasons to Vote for Rick” button, which takes you to a literal list of 99 reasons he thinks you should vote for him – clever and useful! He has an active social media presence, and it is embedded right there on his site. The overall design is pretty dated, so the site could afford to get an updated, modern look. While there is a lot of information, it’s a little over the top with no clear path for site visitors to take. 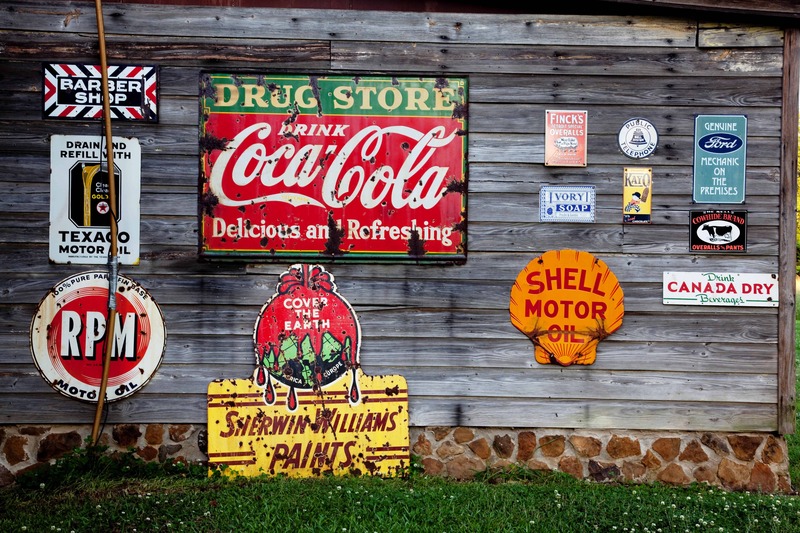 The “99 Reasons” call-to-action is good, but other than that, you really have to rifle through a lot of content to find what you’re looking for. Rick could afford to cut down on the information and just hone in on a few main points. The three main points are really nice below the header image. It shows Bernie’s main values and gives a good synopsis of what he’s all about. The site is clean and doesn’t overwhelm you with information. Clear call-to-action to donate is good. While the call-to-action to donate is good, it may be nice to have another call-to-action in case some people aren’t ready to contribute financially, such as a newsletter they can sign up for. It’s always good to have a way for folks to show they’re interested without necessarily just asking for their money. Again the site design is a bit dated. A little more color and pizzazz wouldn’t hurt to show more personality. Again, the clean look doesn’t overwhelm people. The page is easily-scannable, and people can navigate to the relevant page they’re looking for. The calls-to-action are great, giving people the option to give money, or to contact them with questions. The pictures are good, as they show a commitment to family, and position him as a doting father and husband. It’s always good to have another call-to-action besides just “contact us” and “donate.” Both of these actions require a little too much commitment, especially for folks who are just dipping their toes in the water. Make an easy, low friction option available to them, like “sign up for the newsletter” or “get my list of stances” where they can enter their email and get information, rather than giving money or entering into a conversation. Again the design of the website could use a little updating. Sites that don’t fit the full screen on a desktop show that they aren’t fully responsive, which is a given in modern web design. The call-to-action here is great. She’s getting the word out by having folks host yard signs, which then gets more and more peoples’ attention and brings them to her website as well. That’s great usage of a call-to-action. The site is responsive and takes up the whole screen, and the navigation is clean and easy to understand. The social links are well-placed and are a great addition to get people to her social sites to like and share. Again, more great ways to spread the word. The site is a templated, simple site, and we of course like to see custom-designed websites. Regardless, Liz made the most of this and it still looks nice, modern enough, and most importantly for her, it was probably affordable. A little more color wouldn’t hurt to better engage Cedar Rapids election voters, but it’s a clean look that works well. Nice little introductory paragraph that lets you get a feel for who George is (and his sense of humor). Clear navigation allows you to quickly get to the pages with the information you want to see, such as where he stands on issues and information about him and his life. Again, this was probably put together on a tight budget, with little to no time allocated toward design. With that said, this is an incredibly simple and seemingly outdated site, design-wise. More pictures of George would help. The one image of him on the homepage is small and a little stale. 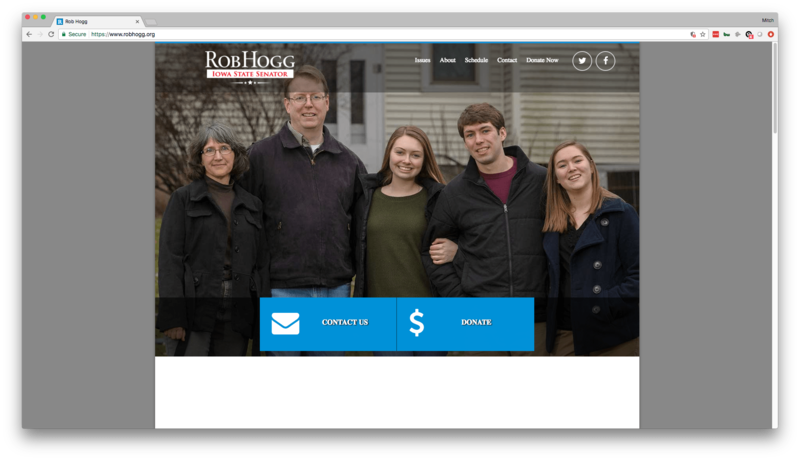 He seems to have a good personality, judging by the text on his site, so it would be great to show that personality in action with images of him shaking hands and interacting with his constituents. 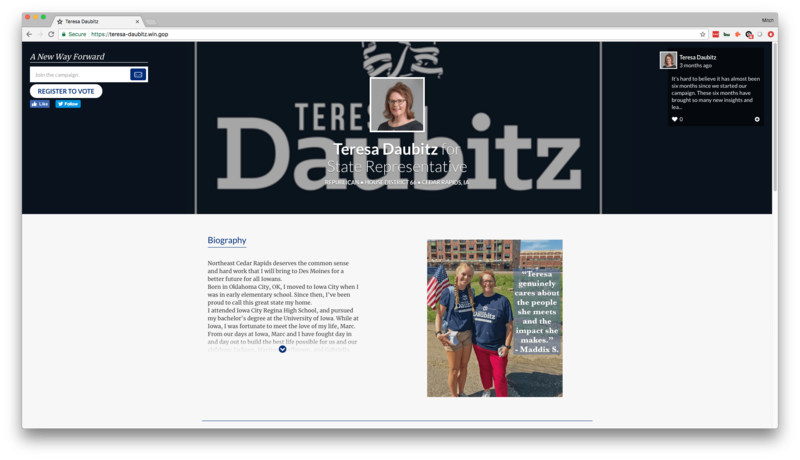 Nicely lays out who Teresa is front and center, with her biography being the main thing that you see on the page. The call-to-action to register to vote is nice and helpful for folks who may not be registered. 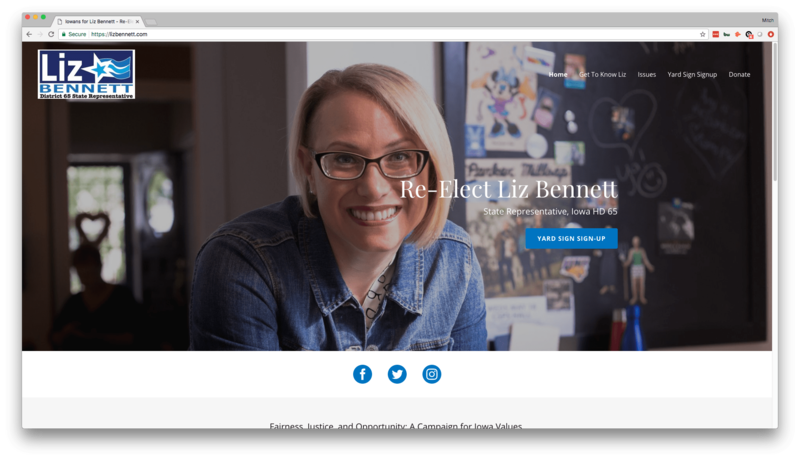 There’s also the option to sign up for her newsletter, which is a strong call-to-action for a candidate’s website. The usage of pictures of her interacting with constituents as well as other politicians is very strong. Shows her personality, experience, and that she cares. This appears to be a GOP-provided web system that is meant for GOP candidates to use on their campaign. That said, it must not be tended to properly by Teresa’s camp because the formatting is entirely out of whack. It’s a weird layout to begin with, then on top of that, things are shifted off-center and it looks a bit messy. The navigation is not along the top like most websites, which confuses site visitors when they first come to the site. When it comes to web design, it’s best to just follow the crowd and have a relatively standard format, because when you deviate from that it will commonly confuse and frustrate site visitors. Clear formatting and navigation – which is always key. Calls-to-action across the home page are great. Clearly he emphasizes volunteering, so it’s good to have that call-to-action there in red to draw people’s attention to it. Lots of pictures, which are really great to show Art and his personality and involvement in the Cedar Rapids area. Not a modern design. It’s not responsive and doesn’t take up the whole screen, which is a dated look. Other than this, the site serves it’s overall purpose very well. This is probably the best Cedar Rapids election site of the bunch. The header image you see there of Eric shaking hands is actually a video that automatically plays, which looks great. The colors and pictures are engaging. The call-to-action is front and center and really nicely designed. 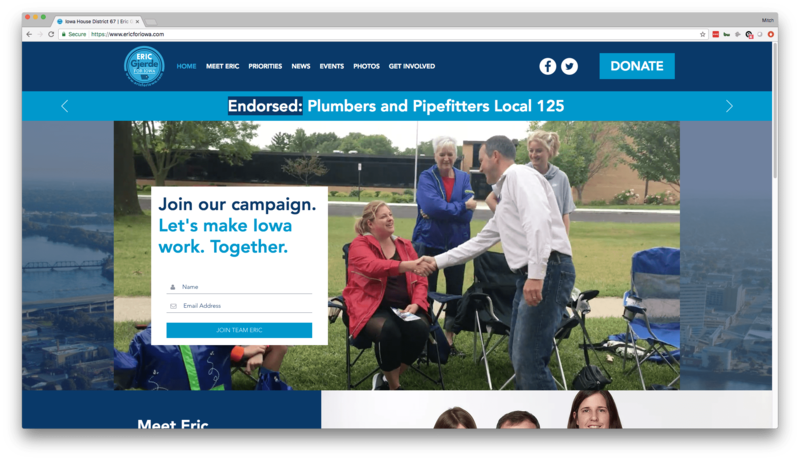 Quick facts about Eric scroll across the top where you currently see “Endorsed: Plumbers…” which is really cool and tells a lot about Eric’s history and where he stands on issues at a glance. Aside from nit-picking, there is really nothing to complain about here. 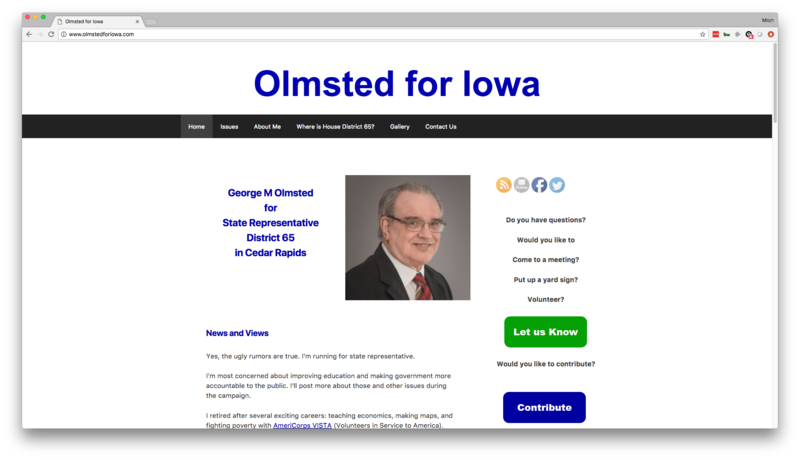 This is a really great Cedar Rapids election website. Again, like Eric’s before this, this is a really nicely designed website with great color and imagery. The site is responsive and fits to the whole screen. Pictures are great and show Ashley interacting with politicians at the state house, showing her experience and credibility. The main thing that seems to be missing is a call-to-action front and center. 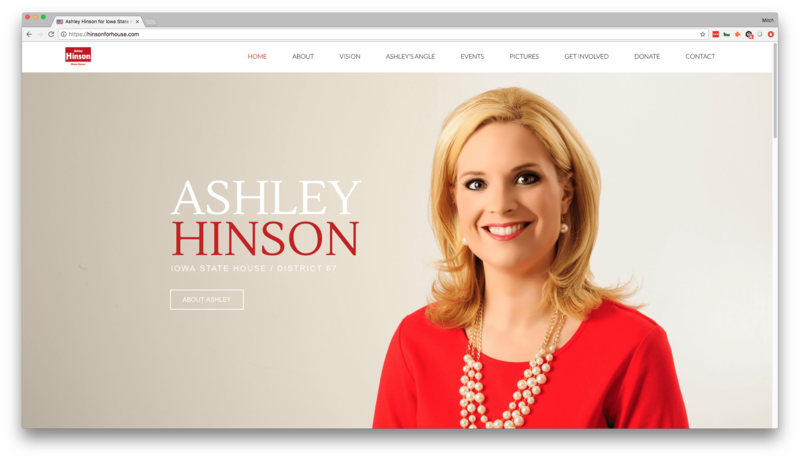 The “About Ashley” call-to-action should be joined by or replaced by a stronger request, like “sign up or newsletter” or the yard sign idea we’ve seen before. 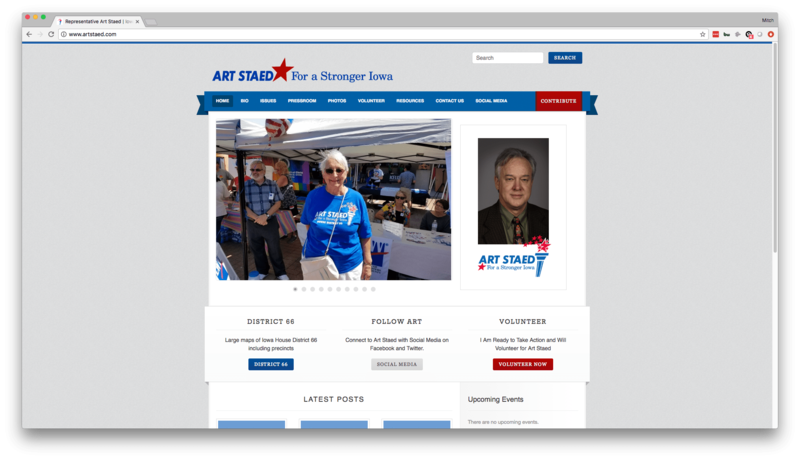 Other than that, this is a really nicely done Cedar Rapids election website! The site is clean and easy to navigate (stop me if you’ve heard this before). 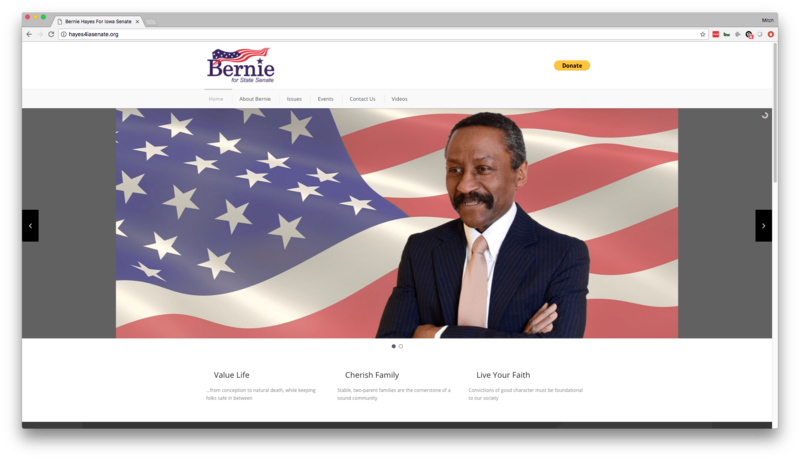 The color scheme of green is a unique choice and a variation from the more common red, white, and blue color scheme that most use political websites use. Whether or not that’s a positive is unclear – sometimes the subconscious correlation people make about color in their minds can be used to your advantage. When folks see Molly, she wants them to picture her in office and as a political front-runner for this Cedar Rapids election. Green doesn’t enforce that political office mindset quite as much as the classic red, white, and blue. Aside from the question of whether green was a good choice, the only other critique is that the images are all relatively low quality. They look grainy on a desktop, which isn’t ideal. The site is designed nicely overall, but low image quality is a knock on the design. This is a nicely done logo Randy has. 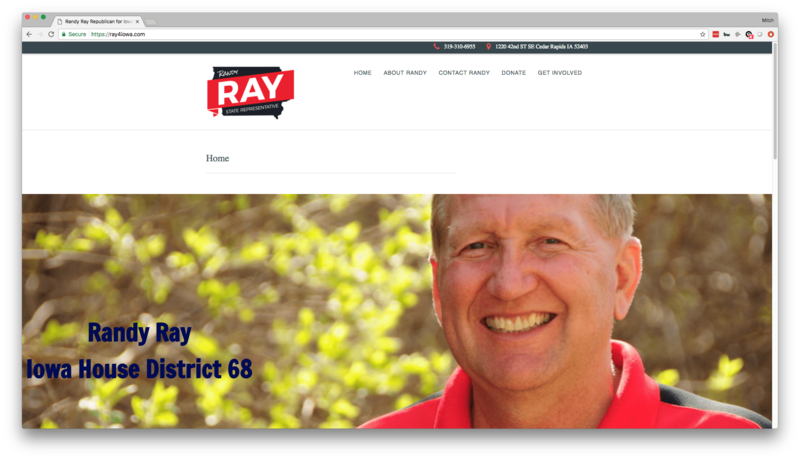 The prominence of it is good, as it certainly goes along with much of his other marketing material, like pins and yard signs that he has probably utilized for this Cedar Rapids election. The navigation is all messed up. For some reason there are two Home buttons, which is some sort of glitch that can be easily addressed on the back end. As you scroll down the home page, you see that things are off center. It looks like the formatting of the page is off, which is another easy fix. Looks like someone just needs to go in the back end and tighten up a few screws and this site would look pretty good overall! When people think of entrepreneurship, thriving business communities, and booming corporations, the usual suspects come to mind. New York, Chicago, San Francisco top the list, with a wide array of others falling in line behind them spanning the country. Cities in Iowa, or any of these “fly over states,” don’t typically cross peoples’ minds. That’s fair, however if you’re considering where you want to start and grow a business, you should consider growing your business in Cedar Rapids. The great thing about growing your business in Cedar Rapids is that you’re not alone. 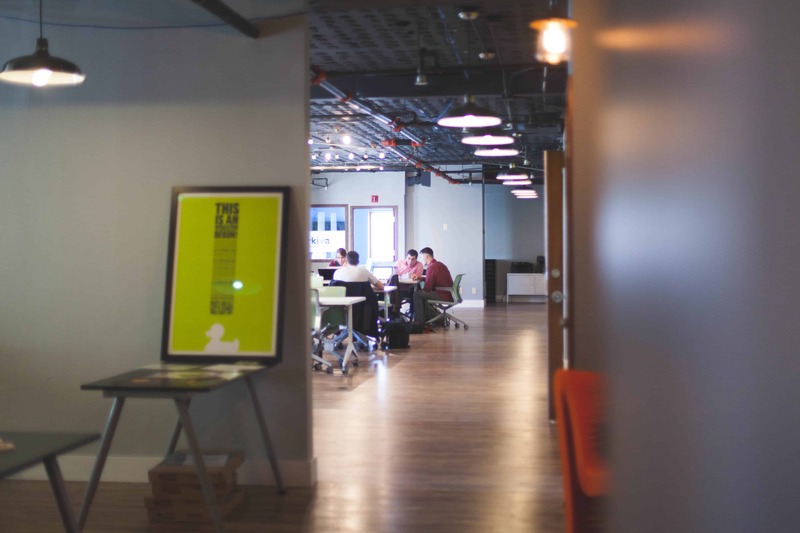 There is a thriving entrepreneurial and corporate business community in Cedar Rapids, and being able to interact and meet with other great business minds and kindred spirits is such an incredible resource for any business owner. With things like NewBoCo, the Entrepreneurial Development Center, and the Cedar Rapids Economic Alliance, there are enough events and gatherings to keep you shaking hands and rubbing elbows with some of the areas top business leaders all year long! I encourage you to visit each of their websites to see the different opportunities they have to get involved in the community. Cedar Rapids is the second-highest populated city in Iowa, and with 142,700 people in the workforce, you’re bound to find employees for whatever industry you might be in. With the University of Iowa right down the road to the south, University of Northern Iowa to the north, and 6 colleges right here in the city of Cedar Rapids alone, you’re presented with a large pool of educated young workers who are anxious to get their career started. If you’re in a more manual labor-intensive industry, see how the likes of Quaker Oats, General Mills, and Whirlpool have kept a steady flow of factory workers employed for decades. Cedar Rapids clearly boasts a large blue collar workforce as well as the more educated, white collar workers. Here’s the thing – if you’re looking to grow your business in Cedar Rapids, you’re far from the first one to do so. There’s an impressive pedigree of successful corporations that got there start, or made major strides here in Cedar Rapids. If you want to see some examples of these businesses that really struck grew (or continued to grow) in Cedar Rapids, check out this list of employers from the Cedar Rapids Economic Alliance. It covers both Cedar Rapids and Iowa City, but it still shows the amazing growth and stability that the area has provided to other major businesses and corporations. As any good business person knows, there are a variety of other factors that determine a business’s success, but having an economy and workforce that supports viable growth is certainly an important piece of the puzzle. 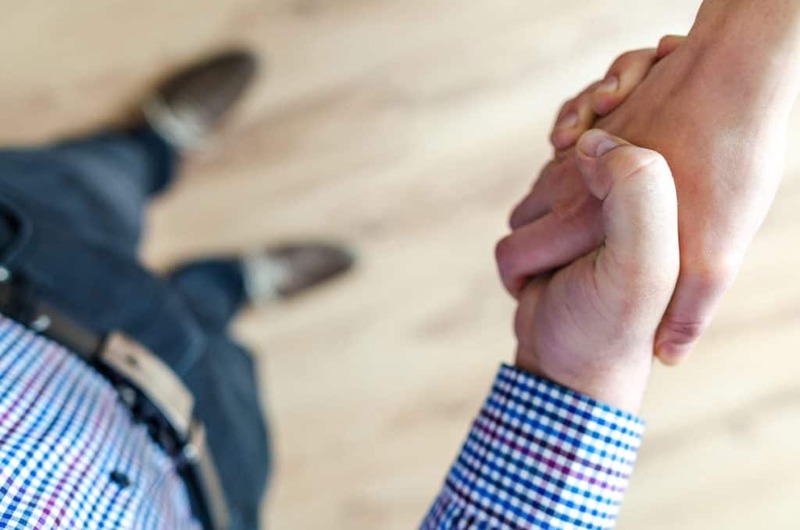 Growing your business in Cedar Rapids is a great idea – if you need further convincing, reach out to someone, anyone, who has grown their business there. They’ll rave about the thriving business community and the quality of life and work you can enjoy in Cedar Rapids. It really is a great place to be! Manufacturing Day is an annual celebration of manufacturing in America. Last week Gilad and I visited a meet-and-greet at one of the large manufacturers in our area, West Liberty Foods. It was a nice event. The community was invited to meet some of the company’s leadership (both corporate and local) and learn more about the company. Also—and this is the best part—we were able to taste the products that they create. West Liberty Foods processes and packages turkey, beef, pork and chicken. They count Subway restaurants, Wal-Mart, and Costco among their global customers. They have several locations across the country. Most importantly to our local landscape, they provide over 900 jobs here in our hometown of West Liberty, Iowa, where their corporate offices are located. Overall, the event seemed well-attended, with quite a few local names and faces coming through. A large high school class also showed up and spent time talking with the plant manager Tom Alberti and others. The local newspaper, The West Liberty Index, came over to cover the event. West Liberty Foods staff was mingling with the crowd, introducing themselves and answering questions. I think the community welcomed this “open house” from a large local manufacturer. I know that sometimes the community can be critical of large industry due to some of the byproducts of manufacturing: noise, odors, traffic, and the like. However, an event like this can go a long way towards helping the community get to know the faces of the people who operate the plant on a daily basis. I also believe it’s important to celebrate manufacturing as a huge part of our economy. Clearly it is a significant part of our national economy. And here in Iowa it plays a massive role in our economy, amounting to over 18% of our state’s GDP. Below are some statistics on manufacturing in Iowa, from Iowa State University’s Center for Industrial Research and Service (CIRAS). Iowa is home to approximately 6,080 manufacturing firms. Manufacturing contributed $34.0 billion to Iowa’s economy in 2016, representing 18.4 percent of the state’s total gross domestic product (GDP). Iowa ranks seventh among all states in its percentage of GDP from manufacturing. The manufacturing sector’s 220,989 jobs accounted for 10.6 percent of Iowa’s total employment in 2016. More than half (53.4 percent) of Iowa’s manufacturing jobs are located in its non-metropolitan counties. Earnings from manufacturing jobs account for 12.1 percent of total earnings in Iowa’s metropolitan areas and 24.0 percent of total earnings in non-metropolitan regions. The average manufacturing job in Iowa paid $56,080 in wages and salaries in 2016. Iowa exported $10.35 billion worth of manufactured goods to other countries in 2016. Impressive numbers! Manufacturing is a backbone of our country, and we are happy to participate in national Manufacturing Day to celebrate this industry. Big Imprint has launched a special focus on helping manufacturers with their online presence. We build manufacturing websites for industrial companies here in Iowa and all around the country. It’s a perfect fit for us, being based in Iowa where manufacturing is so strong.